The Bay City St Patrick's Day Races are a major fundraiser for Bay Area Runners Club, a 501(c)3 Charitable Organization donating proceeds right back into the community. Since 2012, Bay Area Runners Club has donated over $160,000 to local charities and organizations as part of an effort to positively impact our local communities. Sponsorship funds from presenting sponsor Catholic Federal Credit Union, Expo Sponsor Covenant HealthCare, Leprechaun Race Sponsor Renue Physical Therapy and others help to ensure that prices remain low to participants AND contribute to the charitable impact to the community. If you've ever wondered where the registration proceeds go (after paying the significant cost of custom medals, t-shirts, timing, etc. ), then you may be surprised to learn that the majority of it is donated partly to the organizations volunteering at the races year after year AND to various local groups and programs as determined by the Bay Area Runners Club's Board of Directors. 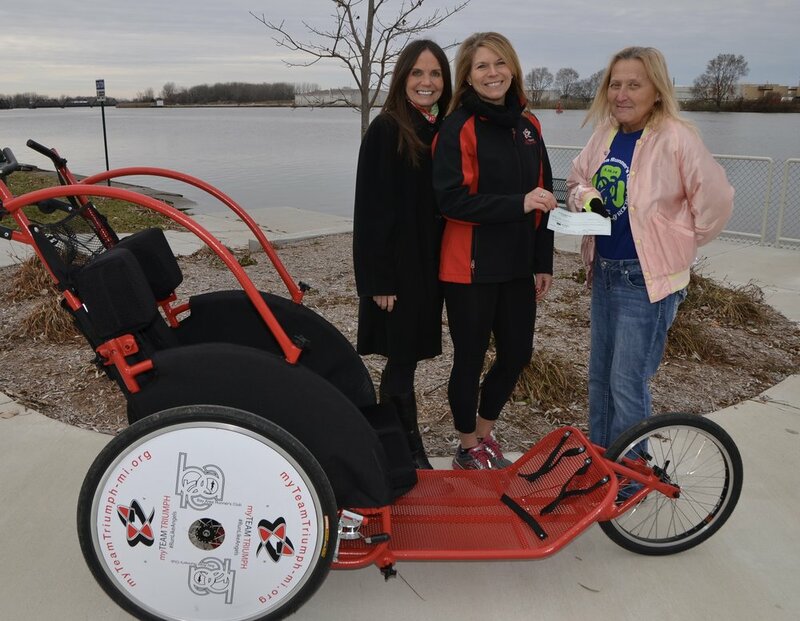 On November 27, 2017, the Bay Area Runner’s Club (BARC) was thrilled to present a $5,000 check to Deb Militello with myTeam Triumph-Great Lakes Bay Region (mTT) to purchase Chariot Race Chair. The feedback from the community after the donation of funds for a similar chair by BARC prior to the 2017 event inspired this second donation. myTEAM TRIUMPH, a 501 (c)3, an athletic ride-along program created for children, teens, adults and veterans with disabilities who would normally not be able to experience endurance events such as triathlons or road races. Linda Flues, a longtime BARC board member, couldn’t be more proud of her running club’s commitment to making a difference in the community. Flues shared something most people do not know, “Money raised at our Bay Area Runner’s Club St. Patrick’s Day Race is donated right back into our community. Last year was the second year in a row we have been able to help myTeam Triumph, which is made possible by the generous support from our title sponsor Catholic Federal Credit Union as well as the many other sponsors who make the weekend a success.” In 2016, more than $25,000 was distributed to local charities and organizations. In 2017, that number grew to over $30,000. And it 2018, over $40,000 was donated back. In 2010, the Bay Area Runner’s Club Scholarship Fund was established and is to this day being facilitated through the Bay Area Community Foundation. The fund will provide $1000.00 scholarships each year to 2 deserving high school students to further their education. The Club is close to having enough funds endowed to accomplish this.